Ocala is in the north central part of Florida. While here we parked at the Ocala Sun RV Resort. Just to the east of Ocala is the Silver Springs State Park. It describes itself as Florida’s original attraction. It has been a national landmark since the 1870s. The Floridian aquifer which underlies the entire state of Florida is one of the world’s most productive aquifers. It supplies drinking water to nearly 10 million people. In hundreds of places this water finds its way to the surface as a spring. Silver Springs is a notable example of this. There are some 60 springs that form the Silver River. The largest spring in this group is referred to as Mammoth and it produces approximately 500 million gallons of water every day. The water emerging from these springs is a constant 72 degrees and is almost totally pure. 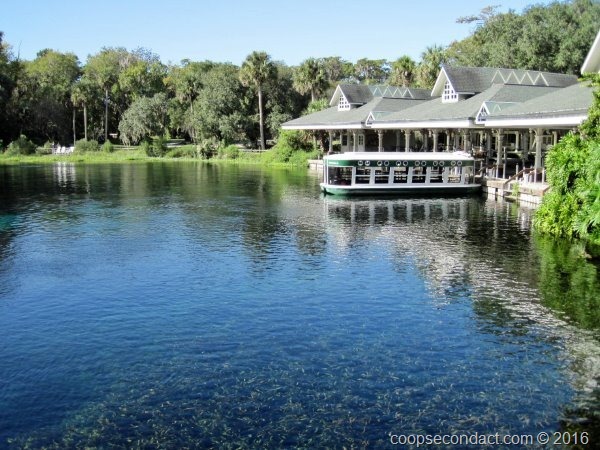 Silver Springs has an interesting history having been used as a location in numerous movies and television shows including the Tarzan series, the Sea Hunt series and the movie Creature from the Black Lagoon. During the 1960s and 70s it was owned by ABC-Paramount. We took the glass bottom boat tour which allows you to see the opening of some of the springs as well as some of the sea life in the Silver River. Did you see any manatees?